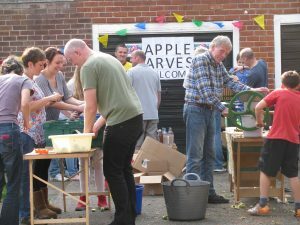 Transition Chester has an Apple press that is available for hire by Individuals, Community Groups and Schools in the Chester area. We also loan out associated equipment to enable you to make good use of apples at harvest time. This includes choppers and cutting mats, a ‘scratter’ for making pulp out of the chopped apples, a ‘workmate’ stand for the press, buckets and jugs. 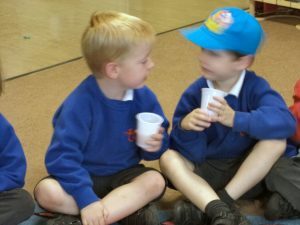 All you have to supply are the apples and your effort to produce delicious apple juice that you can drink straight away, freeze, pasteurise and bottle or turn into cider. The press and equipment is manually operated and safe to use with children under supervision and is an ideal way to enhance a community event in the autumn, or to support your cross-curriculum topics at your school or just to ensure that the inevitable surplus of apples is not wasted. We make a charge of £10 per day to private individuals and schools to hire the equipment but for any public community event we do not make a charge since we want to support voluntary community activity that brings people together. You can book the press online via the button below. Choose your date, check that the press is available and fill in your details on the online booking form. You will normally receive a confirmation within a day of your booking.